Doosan Bobcat EMEA will be presenting the latest products for the plant and tool hire industry from the company’s Bobcat and Doosan Portable Power businesses at the 2017 Executive Hire Show in Coventry, England from 8-9 February next year. Launched in 2007, the Executive Hire Show is the UK’s leading exhibition for the tools, equipment and plant hire industry. It is a trade-only event open to hire executives throughout the UK and Ireland, and it also attracts hire industry visitors from Europe and beyond. Senior executives from the procurement and purchasing departments of the top ten national hire businesses attend the show, along with large numbers of personnel from the many independent hire companies in UK, who typically make up 90% of the attendees at the show. Visitors to the Doosan Bobcat stand will see a display of Portable Power equipment that is representative of the many hire solutions available from Doosan Portable Power such as portable compressors, portable generators, portable light towers and construction tools. The stand will also feature the market-leading Bobcat ranges of micro- and mini-excavators, skid-steer loaders, compact tracked loaders and telehandlers. Completing the stand will be a display of attachments including the unique range from Bobcat, comprising over 80 different types of attachment for Bobcat loaders, excavators and telehandlers. The market-leading portable compressor range from Doosan Portable Power is one of the most comprehensive in the world, offering a full range of 24 different portable compressor models, with free air deliveries between 2 and 45 m³/min and operating pressures between 7 and 25 bar. All the compressors can be supplied with a number of important options as exemplified by the 7/31G and 7/41G compressor-generators supplying 3.0 m3/min (105 cfm) and 4.0 m3/min (141 cfm), respectively, of compressed air at 7 bar (100 psig). Both incorporate an optional 6 kVA generator to meet a specific requirement in utility work, particularly in the gas and water industries, for a compressor-generator combination that provides both electrical power for lights, tools and fusion welding and compressed air for powering breakers and other pneumatic equipment in parallel with the electrical equipment. Every Doosan compressor is ‘built to be used’ providing the highest level of durability, productivity and serviceability. Well-positioned fuel tanks featuring large size fillers limit the risk of fuel spillage. Security features include a lockable canopy and lockable steel instrument panel cover. In addition, a folding lift bail reduces the risk of theft by keeping the lifting eye within the compressor enclosure. The compressors have an intuitive, simple key-start sequence, ideal for rental companies because of the reduced risk of machine abuse by untrained operators. The user-friendly control panel offers an open layout of instruments and warning indicators. 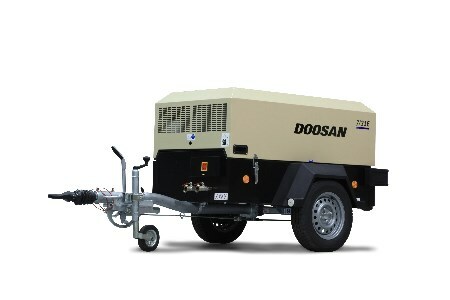 Doosan Portable Power also offers a comprehensive range of portable generators and lighting products for the plant and tool hire industry. Completing the line-up are construction tools such as air-powered chipping hammers, pickhammers, jackhammers and paving breakers for work in demolition, utilities, quarrying and industrial markets. The stand will also feature products from the market-leading Bobcat ranges of micro- and mini-excavators, skid-steer loaders, compact tracked loaders and telehandlers, all of which are ideally suited to the needs of the plant and tool hire industry. Bobcat also offers a unique range of attachments, comprising over 80 different types of attachment for Bobcat loaders, excavators and telehandlers. The very popular, easy-to-transport E08 and E10 micro-excavators are the smallest models in the Bobcat range. The E08 micro-excavator is a conventional model with a machine weight of 1028 kg and a maximum digging depth of 1.82 m. The E10 model is a zero tail swing micro-excavator with a maximum digging depth of 1.82 m and a machine weight of 1066 kg. Both of the micro-excavators have a retractable undercarriage that takes the width of the machine down to only 710 mm, allowing easy access through a standard pedestrian doorway for work inside buildings or entry into back yards and gardens through narrow gates. In addition, passage through low headroom openings is aided by the integrated foldable TOPS on both machines.